Arnold Schwarzenegger (Conan the Barbarian and The Terminator) returns on Blu-ray, courtesy of Warner Bros in a rather stock standard action movie that Mr. Schwarzenegger is known for. With over the top action and acting, it’s a shame that Arnold Schwarzenegger has gone into politics because action movies are generally lacking that memorable Austrian with his bad one-liners that made him a superstar of the 80’s and 90. 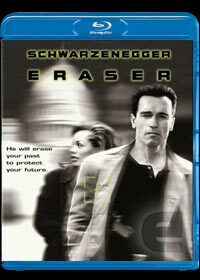 In Eraser, Arnold plays John Kruger who erases identities and places people into witness protection programs by staging their death and creating a new life for them. Unfortunately for Kruger, his luck is about to run out when he is given the task of protecting Lee Cullen (Vanessa Williams) who has in-depth knowledge of a corrupt multinational company. This knowledge involves the production of highly powerful weapons which are being sold to nefarious individuals and terrorists groups and to compound the situation, Kruger’s partner, U.S. Marshal Robert Deguerin (James Caan) has been paid by this company to eliminate not only Cullen but also his partner of many years. From here the action starts in this roller coaster action movie that also stars James Coburn and James Cromwell (Babe) in this clichéd movie that is entertaining from start to finish. The one-liner about the alligator that Kruger kills “You’re luggage!” is a classic and interestingly enough, the movie is matched by some great special effects without too much use of blue screens and computer generated images. The video quality on Blu-ray features sharp images and vibrant colours that although looks impressive on Blu-ray, it cannot be compared to the features of today. The audio also uses Dolby TrueHD 5.1 which sounds phenomenal and goes hand in hand with video and the story. It may not be the best Arnold Schwarzenegger movie, however it still delivers heavy action and some great Arnold moments! Unfortunately he won't be back!